Win a Pizza Feast from Godfather’s Pizza! – Enter Online For A Chance To Win A Pizza Feast To Include: 1 Jumbo Specialty Pizza, 18 Wings A 2 Liter Of Soda And A Cinnamon Streusel Dessert Pizza! You Only Need To Enter Once. A Winner Will Be Drawn The Last Friday Of Each Month!!! 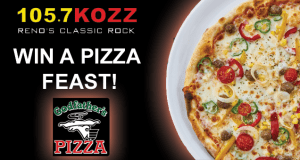 Pizza Feast With Godfather’s Pizza And 105.7 KOZZ!